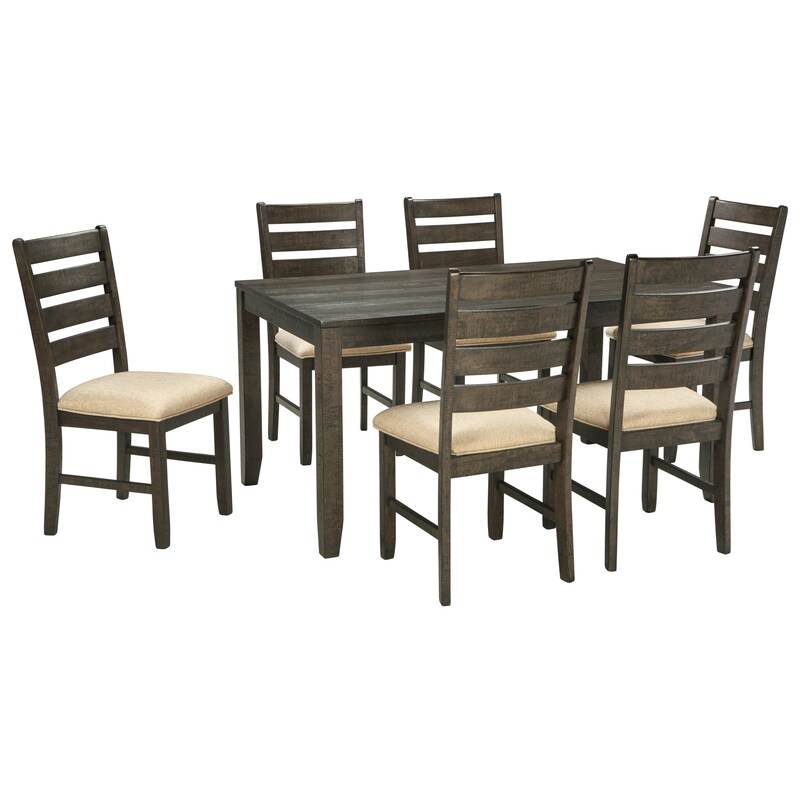 Made with birch veneers and hardwood solids, this seven-piece dining room table set features a rough-sawn plank texture for rustic character and a versatile warm brown finish. The rectangular table with block legs creates a great setting for meals at home. The contemporary style ladder back side chairs offer upholstered seats with a light brown textured fabric. The Rokane Contemporary 7-Piece Dining Room Table Set by Signature Design by Ashley at Miskelly Furniture in the Jackson, Pearl, Madison, Ridgeland, Flowood Mississippi area. Product availability may vary. Contact us for the most current availability on this product. 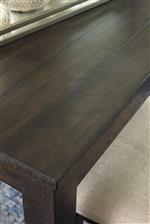 Table Info Dimensions: 36.00" x 59.88" x 30.00". Apron to floor 26.50". Side Chair Info Dimensions: 17.75" x 21.38" x 38.63". Seat width: 17.75". Seat depth: 17.75". Seat height: 19.38". The Rokane collection is a great option if you are looking for Rustic Contemporary furniture in the Jackson, Pearl, Madison, Ridgeland, Flowood Mississippi area. Browse other items in the Rokane collection from Miskelly Furniture in the Jackson, Pearl, Madison, Ridgeland, Flowood Mississippi area.